…each painter’s own world of art. Thanks to The International Association of Art Critics, (AICA) I have been working for the first time with a text, not as its author, editor, publisher, or designer but as part of a team of translators. The work being translated is an anthology of art writings by the Korean art critic Lee Yil (1932–1997). I am working directly with the artist Bada Song, contributing my knowledge of art writing, criticism, theory and art history as well as my more limited familiarity with Korean language, history and culture. Bada Song, as well as having a requisite artist’s sensibility, is contributing her fluency in Korean and English. Meanwhile, we are also working, more indirectly, with the anthology’s first translator Shim Chung, and with AICA’s Henry Meyric Hughes. Lee Yil’s writing draws and redraws many key modern art-historical ideas into dialogue with Korea’s long history and deep culture. Though dealing with matters of modernism and postmodernism, he nevertheless sets his arguments within ‘5,000 years’ of Korean tradition. The more I worked with Lee Yil’s words and ideas, the more I appreciated their continuing relevance and the lessons and guidance they might contain for us today, not least in terms of how we continue to struggle to accommodate personal, local and national identities within an increasingly impersonal, technologised, capitalised and globalised world. The writing that follows also builds on an article I published for Third Text’s online resource last year (in which I also argued for a model of ‘holistic relativism’), and uses a certain influence and impetus, gleaned from this translation project, to further investigate the issues of globalisation and isolationism I discussed there. The writings of art critic Lee Yil suggest that art might be capable of playing a significant role in preserving a national, cultural identity, and yet doing so in a noble, sensitive, considered, and anti-barbaric manner, even during times of national and international upheaval. Today, the Korean nation and its physical peninsula remain crudely and nervously divided, according to the wishes, interests and fears of external ‘superpowers’. A proud and beautiful country, and its rich culture, has been, first forced, then allowed over time to become two increasingly different ‘nations’ with radically different ways of life, that might, by now, seem so different as to be un-reconcilable, or un-re-uni-fi- able. Nevertheless, tradition, language, art and culture are ancient and resilient resources, in which, and by means of which, continuity and unity might yet persist, survive, surpass and surmount the colonisation, physical destruction, and ultimate rupture that Korea has undergone. 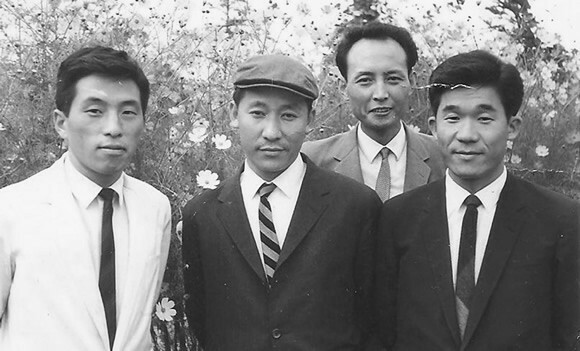 Lee Yil, and the art and culture he championed, lived through and aimed to look both before and beyond this relatively recent historical imposition, always considering a country that has never ceased to be also ‘unified’ by its arts, and in particular its special language and writing, Hangul. Hangul was purposefully, progressively and pragmatically carved out for the Korean people, in an exemplary act of regal philanthropy by King Sejong in the mid-fifteenth century, and continues to admirably serve North and South Korea alike, along with, of course, many other ancient acts of Korea’s shared culture, customs and traditions. Today, Korea appears to have been left to suffer a crude and shortsighted division, convenient not to itself but to the relevant external ‘superpowers’. The divided peninsula has come to resemble a historical caricature of the twentieth-century’s most destructive modern dialectical division into capitalism on one side, and/or communism on the other. Meanwhile, ironically, this is a twentieth-century dichotomy that the invested external superpowers have allowed themselves to move beyond, eg by means of China’s so- called ‘Capitalism with Chinese characteristics’; or Europe’s ‘Third Way’ Social Democracies; or Russia’s peculiar, nouveau-riche post-Soviet airs (not forgetting that Germany has allowed and enabled itself to be re-united). The ‘de-militarised zone’, between the two Koreas, while defaulting to a ‘re-natured’ reserve of exceptional beauty, suggestive of a kind of Edenic origin, might remind us that this divided ‘nation’ is still a united ‘land’, joined by its physical terrain as well as its shared language, but also – if somewhat paradoxically – ‘joined’ by its ongoing war with itself, a war generally perceived as concluded but which is in fact in a state of truce. Such a situation strangely unifies war with peace, chains the future to the past, and perversely ‘unites’ the country in an uncomfortably active state of unresolved division. Despite the country’s heavily enforced division into two opposing ‘sides’, there are inevitable porosities and exceptions, certain kinds of economic and cultural exchanges that cross the dividing line. As well as a small but steady flow of surreptitious defections, Kaesong industrial zone – a small factory complex within the Northern territory – is staffed by both Southern and Northern workers, and its profitability benefits both sides. Meanwhile, literature, propaganda, and sweets (notoriously something called ‘Choco-Pie’) are regularly floated across the border, from South to North, through the sky, attached to balloons. It is tempting to draw such images, as analogies, into an unfolding discussion of translation and migration. eg we can interpret the ‘re-naturalised’ and ‘de-militarised’ zone as akin to that ‘utopia’ or liminal space, the necessary space of uncertainty, where translators hesitate, debate, weigh and compare possible solutions, before committing to one word or another, one way or another, coming down on one ‘side’ or another while always aiming to ameliorate issues of difference. Ultimately, if we take this analogy closer to its limit, the translator’s ambition could be seen as a will-to the ‘reunification’ or re-naturalisation of a word, words, or phrases and ideas, sundered from their roots, made temporarily homeless, and thrust into a crisis, albeit for and by the relatively luxurious requirements of translation, only to be subsequently and sensitively recomposed as peacefully and permanently as possible, and in such a way that little or no trace of the translation’s disruption, of the translator’s intervention, is apparent to subsequent readers. It is not difficult for us to refer to art as a ‘language’, ie a means by which to communicate ideas, feelings, traditions and techniques. And while we can refer to art in general as a ‘language’ we can also, and equally easily, refer to the various ‘languages’ of various media, eg the ‘language’ of painting or paint, or, for that matter, the ‘language’ of a certain artist or ism; the ‘language’ of modernism, the ‘language’ of Louise Bourgeois. And so, just as an art, or an artist, might have a ‘language’ of their own, so too they could be regarded as also occupying, or even constituting their own land, nation, country or ‘world’. While the studio artist may blithely use words as materials, within or alongside images; and while writing is itself considered an art (in terms of crafted prose or calligraphy), the art critic’s particular deployment of words may be driven, not by the aim of making art but of serving it, albeit in the noblest possible way. The model of the critic provided by Lee Yil serves the artist and the art ‘world’ relatively altruistically, articulating an artist’s particular ‘world’ as an act of affirmation, and in the respectable capacity of a kind guide and translator. To translate the writings of Lee Yil thus inevitably becomes the translating of a translator and the translation of a series of translations. His anthologised writings remind us that the art critic is invariably an interlocutor, a sensitive, vigilant and critical intermediary who cultivates a certain intangible space that lies between the artist and their art; between art and its institutions; between institutions and the wider public; between contemporary art and art history; as well as between art, artists, institutions and the market. In a process of translation, we do not only look for the equivalence of single words but strive to understand, interpret and translate grammatical phrases in the context of the whole, meanwhile always considering the possible motives and intentions of the author. In the many, difficult disputes and debates – a ‘war of words’ no less – involved in tussling, over several months, in the direction of what the combined translators now hope is a lucid and accurate final translation of Lee Yil’s anthology, it felt as though myself (as an interpreting art writer) and my partner Bada Song (as an artist/translator), and all the participants in the process, were searching for a harmonious reconciliation, whereby through and perhaps despite our interventions, the text would once again be at peace with itself. From the moment the text had been brought into a state of conflict, divided by the demands of translation, we were tasked with trying to ‘reunify’ the text’s ideas, words, phrases and paragraphs rendered in a different language. We regarded it as our duty, and a significant historical, professional and cultural responsibility (which weighs heavily), to consider each problem, every time anew, and to see it as much as possible ‘in the round’. Each word, phrase or concept, was made momentarily homeless in the process, and so our role was to search for a new home, within a new ‘host’ word, and a new ‘host’ language. Philosopher Gilles Deleuze once used the phrase ‘perceiving on the horizon’, and this might help to describe the sense in which translation simultaneously demands due consideration of a dual, reciprocal and mutual perspective.1 Each word, phrase and concept is required to pause in a temporary utopia between languages, where it is held-up, interrogated, turned over and over, until it can be seen both from the perspective of the language from which it is departing and from the perspective of the language to which it is travelling. Perhaps in this respect at least we might speak of ‘the other side’ of a word, and thus speak of my title. ‘The Other Side of the World’ is a phrase used commonly in English, and yet perhaps without sufficient consideration. By removing one letter, barely a slash of the pen or tap of a key, it reads: ‘The Other Side of the Word’, and by means of this play we can draw attention to the fact that neither the word nor the world necessarily have ‘sides’. A world, or the world is a less geometric or Euclidean thing than we would perhaps like to think. It is even perhaps relatively formless, and surely something without ‘sides’. A ‘world’ may not be a ‘thing’ at all, but rather a description of a sensual environment or continuum of experience. A ‘world’ might be considered ‘spherical’ in both the literal and metaphorical sense, and as we might speak of moving in cultural ‘spheres’, so we might – and perhaps particularly within the so-called ‘artworld’ – encounter a possibility of ‘worlds within worlds’. However, none of these variations and interpretations could convincingly suggest or promote a world with ‘sides’; sides that might delimit particular areas and divisions that give clear form to an object, or can be clearly opposed. We might be content to concede that a cube does unarguably have ‘sides’ that necessarily constitute its particular form. Meanwhile, we may enjoy mysteriously evoking a ‘dark side of the moon’, but any sphere encumbered with a notion of ‘sides’ is likely to feel uncomfortable, imposed-upon, restricted, or even contradicted. My title also allows us to consider the difference between ‘world’ and ‘word’ (or perhaps ‘the world’ and ‘the word’). Can a word be a ‘world’, and/or is a ‘world’ ultimately just a word? These, possibly frivolous musings can nevertheless be considered in terms of, and in the context of the particular experience of translating art critic Lee Yil’s own words, which are always deeply engaged, first with the world as a shared planet (divided into continents, nations, divided nations, languages, cultures and histories); then with the ‘art world’ (considering both the international ‘art world’ and the Korean ‘art world’); and furthermore with the individual ‘worlds’ of the many artists whom Lee Yil supported, encouraged, and as it were ‘translated’ during his career. Perhaps in this way we might hope to allow the languages, peoples, perspectives, times, places and meanings involved in a translation to ‘migrate’; travelling in the direction of one another, passing through and across one another in the process of ultimately becoming one another. 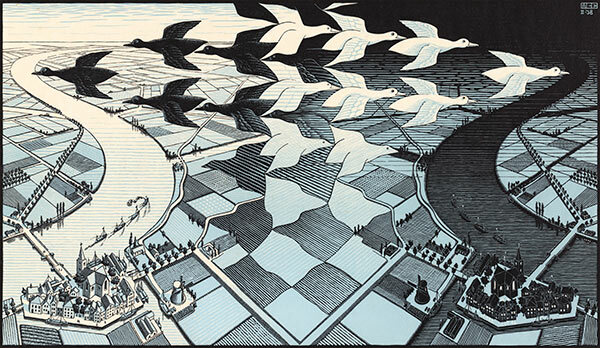 While writing these words, the well-known graphic woodcut, Day and Night made by MC Escher in 1938 imposed itself on my memory, surging up, unbidden from the depths of the past, as an example of the kind of art that, as a child, I might have found curious, thought-provoking, intricate etc. I include it here, somewhat serendipitously, and at the risk of incongruity and anachronism, but in the hope that it might provide some useful visual reference, or stir further, unexpected connections. In and by an act of translation, words and ideas might be said to ‘migrate’, encouraging us to consider, engage, and benefit from the points of view of others; to, as it were, ‘walk in others’ shoes’ and ‘see through others’ eyes. Ultimately, in this consideration, we must be guided and inspired by some form of the noble, necessary and ambitious human aspiration to altruism. Both translation and migration blur, break through, and break down barriers, territories and boundaries, questioning any fixed notion of belonging and location, inevitably disrupting and relativising established perspectives, while questioning identities as determined by changing contexts. Both translation and migration might ultimately aspire to an altruistic ideal of ‘holistic relativism’, implied by our potential for, and perhaps our ultimate, deeply sensed need for, some form of universal understanding that might eventually bring an end to the shameful and painful conflicts and misunderstandings with which humanity regularly confronts, condemns and confounds itself. We might define migration as a means by which, not only people, animals, birds, and the seeds and spores of plants, but also words, ideas, thoughts and languages flee, or voluntarily relinquish their homes, to travel, often bravely, sometimes blindly, in the hope of re-establishing themselves (or merely spending a season) in a new context. Meanwhile distant, unknown others might pass, host, welcome, or even be willing to exchange places with them. ‘Migration’ might tend towards association with the animal realm, (notwithstanding of course the animal within us). In the popular imagination at least, before referring to human tragedies, it inevitably suggests inspiring images of birds in flight on epic journeys, or herds of mammals traversing a plain. However, ‘migration’ invariably implies an inexorable, instinctive and pragmatic compulsion to travel or to flee, usually from dearth, inclemency and other forms of threat, in search of safety, comfort and plenty. Meanwhile ‘translation’ is more likely to imply a conscious process of evaluation and equality, conducted primarily with and between different spoken and written languages, different peoples, nations and locations. We could also acknowledge the fact that, in our highly cultured and sensitised ears and minds, these terms conjure quite different associations, eg ‘migration’ might seem more ‘worldly’ (physical, mobile, multi-dimensional); while ‘translation’ reads as more ‘wordy’ (abstract, conceptual, representational). ‘Translation’ is a word whose particular mobility suggests an intangible exchange, while ‘migration’ suggests actual movement through real and significant space. However, translation, migration, and translation-as-migration inevitably cross, and by crossing thereby cross out, natural barriers and both politically imposed and linguistic borders. Words transform as they travel, grow new feathers in-flight, change costumes, morphing from one form to another, one interpretation to another, but with the ultimate aim of maintaining a same. Translation-as-migration creates a likeness that is also a difference; a consistency which reveals fluidity and flux; a reliable and enduring accuracy which nevertheless invokes alternatives and points to possibilities. The first part of Lee Yil’s anthology is composed of a series of theoretical and art historical essays, explaining modernism and postmodernism while carefully situating a contemporary history of Korean, modern and contemporary art within them, though never as an imitator or subordinate but always as a proud and unique culture with a special perspective on, and contribution to make to these late twentieth-century debates, styles and isms. Lee Yil consistently and persistently took pains to show that Korean traditions pre-empt, anticipate, echo and translate many Western, modern and postmodern isms, many movements, styles, techniques and ideas – yet without imitating, nor playing the subaltern role. Significantly, Lee Yil appeals to the authority of ‘5,000 years of Korean traditions’ in arguing for an appropriate level of respect and consideration for Korea’s own art and culture. The artists and works he champions may be assimilable to, for example, modern, modernist, minimalist and expressionist discourse, but Lee Yil always insists upon, and strives to convince the reader of their integrity, authenticity, and rootedness in an ancient Korean tradition, despite their apparent modernity. Thus they exist ‘one in the other’, West in East and East in West, their modernity wrapped in tradition, their tradition wrapped in modernity. The second part of the translated anthology of Lee Yil’s writings is composed of a series of cameo-like analyses of individual artists and their work. One of the consistent idiosyncrasies discovered in the process of translation was the way in which Yil uses the word ‘world’ to refer, apparently, to an artist’s practice, technique, rationale, biography, belief, career and milieu. We may not be able to think of a current artist or critic using the word ‘world’ in this way, and yet, it may strike us as useful; as something we might wish to revive today. I would like to suggest that this use of the word ‘world’ – apparently referring to what might otherwise, and more simply be called a ‘practice’ – is not a mere matter of rhetoric or affectation, but rather reveals a distinct, important and useful, temporal and cultural difference in Lee Yil’s understanding of just how art and artists exist and work, with and within their own ‘world’, and in the wider, ‘world’. It may appear ‘modernist’, poetic or romantic to describe an artist’s life and work as their ‘world’, but on reflection it could also be argued that it is appropriate and applicable to any deeply committed artist of any era, eg: Andrei Rublev, Basho, Leonardo, Van Gogh, Louise Bourgeois, Tracy Emin, Charles Avery, Henry Darger, Jon Rafman, Hito Steyerl or Ryan Trecartin all come to mind, along with Lee Yil’s own Korean pantheon, as artists who not only make works in and for the (objective, shared, external) world but also, and thereby, invent and maintain their own (subjective, personal, internal) ‘world’ within that world. Following Lee Yil’s example, use of the word ‘world’ to describe an artist’s way of working, thinking, and living then seems, if anything, more appropriate than habitual and perhaps reductive, divisive, technical and instrumental terms, such as: ‘practice’, ‘career’, ‘rationale’, ‘style’ ‘milieu’, etc. Thus, we might be willing to concur with Lee Yil, to import his vocabulary, and concede that artists inevitably occupy a ‘world within the world’, and in this way exemplify a useful model of peaceable coexistence; a model of ‘worlds within worlds’. It is also important to note here that ‘worlds’, once considered in-tensively (in the Deleuzian sense) rather than ex-tensively; and imaginatively rather than empirically, are able to exist or persist within other worlds. That is to say, the presence of one world does not thereby eliminate the other, as in the case of more prosaic and ex- tensive interpretations of bounded, physical territories. This may be significant if we are to pursue a line of thought linking translation to migration and connecting both to our most ambitious altruistic aspiration to fairly and peacefully share a planet. If a model of ‘worlds within worlds’ could then be productively offered to our troubled planet, it may also be applicable to our anxious societies and dented dreams of democracy, all of which have perhaps been too-long perceived according to a certain spectacular ‘scopic regime’ which organises, divides, occupies and ‘knows’ the world according to a visible, ex-tensive and thereby exclusive, territorial schema, ie a world divided up and seen as your side and my side, their side and our side. While traveling to Paris to give this paper, the Eurostar allowed me to move, uninterrupted and at speed, through a tunnel, beneath the sea, avoiding the suffocating cold water above me, the rock, mud and slime beneath. I passed in relative comfort, from one salient and significant land mass to another, each identified and distinguished by different names, languages, flags, cultures, histories, traditions, etc. A certain trust and understanding between the inhabitants and authorities of these distinct landmasses, meant I was allowed to pass unimpeded. In the process, I left behind one ‘land’, in which a certain language is dominant, and entered another ‘land’ where a different language rules. We might assume that this difference is largely and historically determined by a certain distance, a boundary, the presence of the sea perhaps as an effective physical barrier to any more porous, consistent and comprehensive exchange that might, over the centuries, have otherwise erased the linguistic distinction between these two ‘countries’. And here we have attached inverted commas to the word ‘land’ and to the word ‘countries’, if only because they remind us of a certain, perhaps arbitrary choice we have to refer to Britain and France as either ‘countries’, ‘lands’, or ‘nations’. Any of these words would be true and current, and yet each comes with slightly different connotations leading us to suspect that none is definitive. The same can then be said for language as a whole, that it should be regarded as convenient and conventional but never as definitive. In this respect, language in its entirety, language itself, above and beyond any particular language, reveals itself to be a matter of constant translation, the constant translation of the ‘world’ into the ‘word’. One way to begin to challenge an ex-tensive model of a world, with a more in-tensive model, might be to consult our ‘visibly impaired’ or unsighted comrades, or perhaps cover or close our own eyes. In this way we are brought into dialogue at least with a more complex, questionable, multiple and varying sense of just what our ‘world’, or ‘our’ world might be. The simple act of closing our eyes (with which we are intimately re-acquainted on a nightly basis), brings into doubt the extent to which we can ever refer to any physical environment as ‘our own’. And, we might add, words could also be said to exist as ‘words within words’ according to the non-spatial differentiations of both Saussurean linguistics and Derrida’s development of the same into the paradigm of différance. To see, it seems, is all-too-often to own or to desire to own. However, our hearing (as Jacques Derrida alluded, in his book The Ear of the Other) may be a little more accommodating, in its relative passivity, which is – we might argue- just as ‘sovereign’ in its graceful and generous deterritorialisation as the eye is ‘regal’ in its avaricious tendency to make and maintain territorial claims. What we call a ‘world’ is never simply laid out as if ‘for us’ (and therefore ‘against them’), never simply apparent, as clear, bright, visible, spatial, known, territorial and extensive. Any ‘world’ is always also aural, dark, labyrinthine, uncertain, shifting, formless, unknown, imaginary, and sensory in the very broadest ‘sense’. Nor is a world merely socio-economic, political, cultural, linguistic or even anthropomorphic. It is however, experiential, intensive and event-ful, and in this way we might share experiences and events; lands, nations, countries and ‘worlds’; ‘one- in-the other’ (a phrase also repeatedly used by Deleuze). One ‘world’ does not necessarily, and does not need to, exclude, counteract, or cancel another, and this is a valuable model, related to the pursuit of a ‘holistic relativism’, that I feel able to absorb from my brief but intense encounter with Lee Yil’s anthology of art writings, and the process of translation. This is an edited version of a paper given at AICA’s 50th annual congress, held in Paris, November 2016. The paper contributed to Day four’s theme of migration. Paul O’Kane is an artist, writer and lecturer. He studied BA Fine Art and Art History, then MA Visual Cultures, and completed a doctorate in History at Goldsmiths College, University of London (2009). He is a Lecturer in Fine Art and Critical Studies at Central St Martins College, London and makes and exhibits artworks concerned with a history of technologies and narrative. He writes for leading art journals, including Art Monthly and Third Text and has published well over a hundred articles, reviews and catalogue essays. He is a founder member of artists’ book publishing company eeodo with whom he published Where Is That Light Now? (photography and memoir) in 2014. He is a Member of AICA (International Association of Art Critics) and blogs at ONLY YOU.
. It starts from the self, and to the extent that one is privileged, living in a rich country, one might ask, what can we do to make this situation last? One senses that dangers exist, that it might not last, it's all so crazy, so what might be done so that Europe lasts? Being on the left is the opposite: it’s perceiving... And people say the Japanese perceive like that, not like us... they perceive first the periphery. , they would say the world, the continent – let’s say Europe –, France, etc. etc., rue de Bizerte, me: it’s a phenomenon of perception, perceiving the horizon, perceiving on the horizon.’ See: ‘G’ as in ‘Gauche’, in L'Abécédaire de Gilles Deleuze, avec Claire Parnet, Gilles Deleuze’s ABC Primer, with Claire Parnet, TV series directed by Pierre-André Boutang (1996) and transcribed as a website, here: http://www.langlab.wayne.edu/CStivale/D-G/ABC2.html. 2 In support of such a Barthesian mode (ie invoking Roland Barthes’s influential deconstruction of the modern authorial conceit), we might also note that Jacques Derrida, in an essay on translation, claimed that it is only the translator who truly writes and only the translator who truly reads. The implication is that we come to a truer form of writing (and reading) by setting a model of the relatively altruistic translator in place of the model of the relatively self-interested author (but also in place of Barthes’s ‘reader’ who is born, famously in Barthes’s conclusion, at the expense of the dead author). 4 And, we might add, words could also be said to exist as ‘words within words’ according to the non-spatial differentiations of both Saussurean linguistics and Derrida’s development of the same into the paradigm of différance.